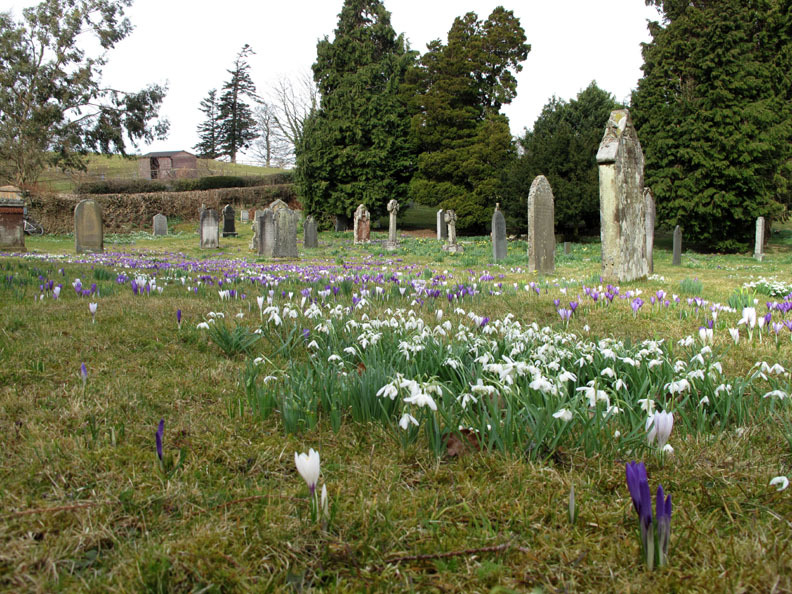 Date & start time: Tuesday 23rd March 2010, 10.20 am start. 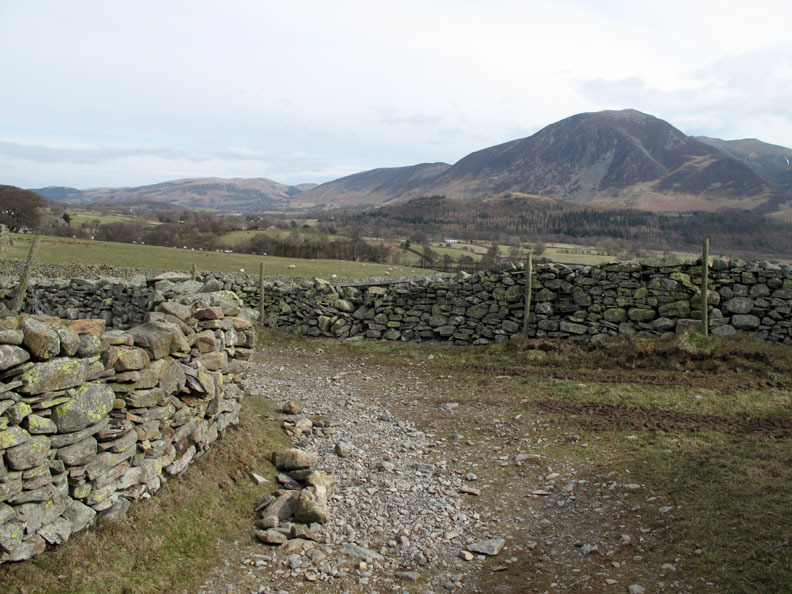 Places visited : Kirkhead Farm, Mellbreak's northern and southern summits, Scale Knott, High and Low Ling Crags and back via the lakeside path. 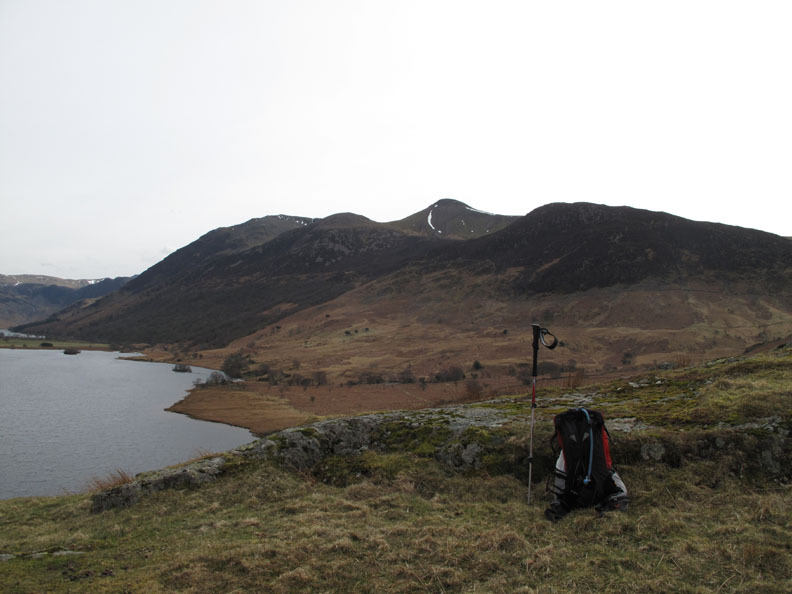 Walk details : 6.2 mls, 1865 ft, 5 hrs 20 mins including lunch. 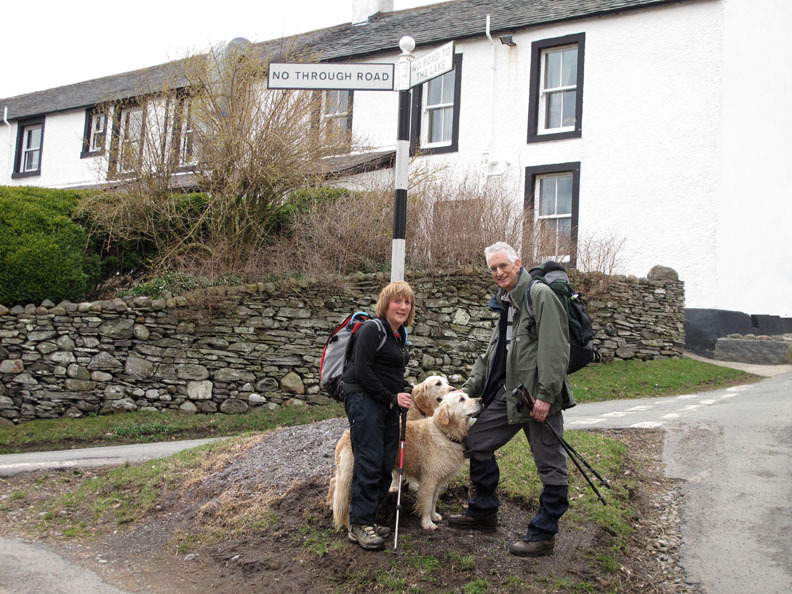 Walked with : John Grayson, Ann and the dogs, Harry and Bethan. Weather : Sunny to start but becoming overcast. Rain forecasted for late afternoon. 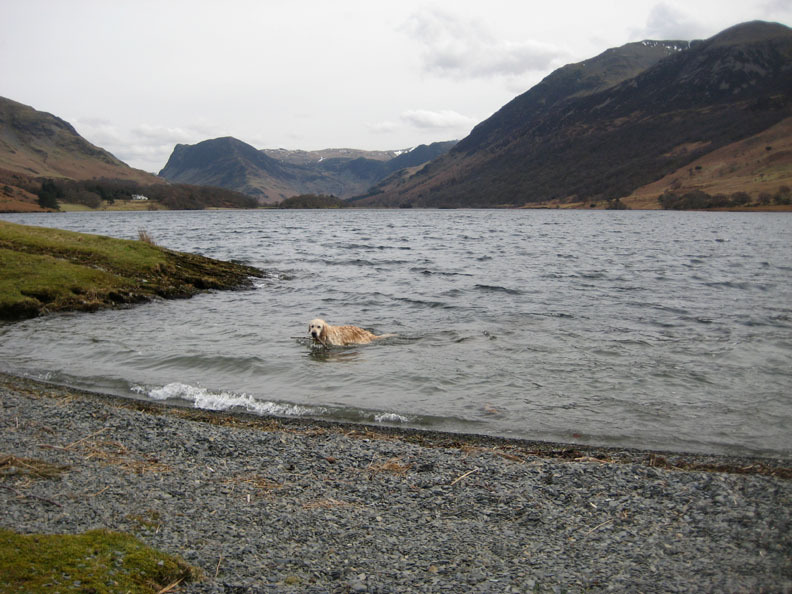 John, a Loweswatercam viewer, is up on holiday in our part of the Lake District. 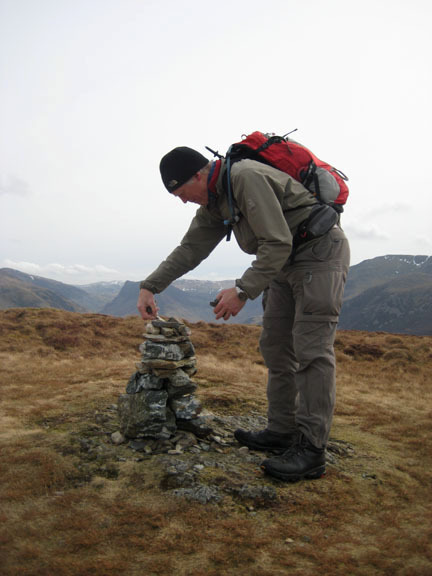 He has never climbed Mellbreak so kindly entertained us with a meal out in the evening. 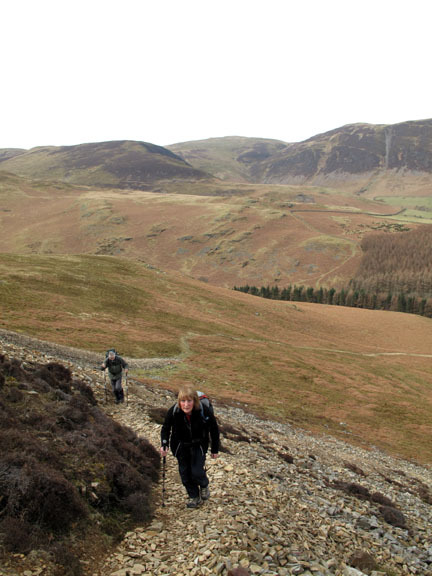 In return we offered guiding duties up the steep northern face of Mellbreak. 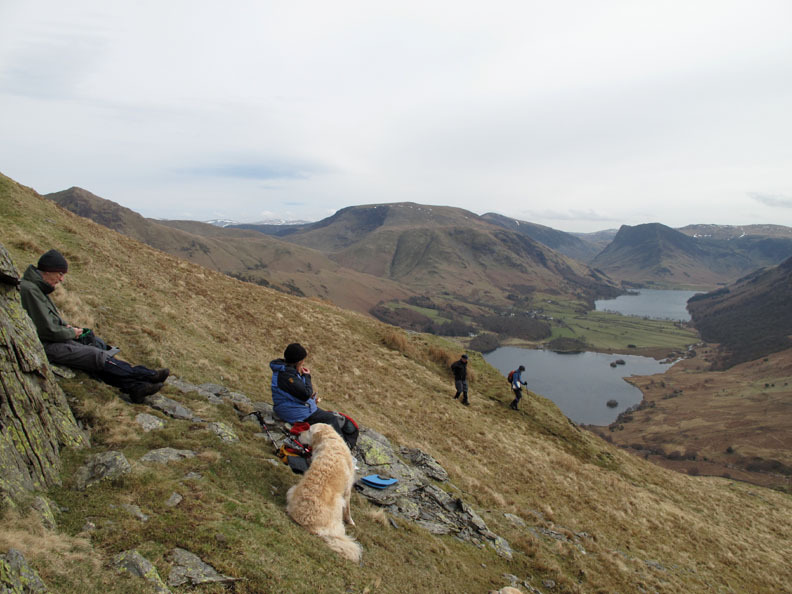 It worked out beautifully as both the meal and the climb were a delight ! A prompt start today, well prompt for us, as the forecast is for rain later. 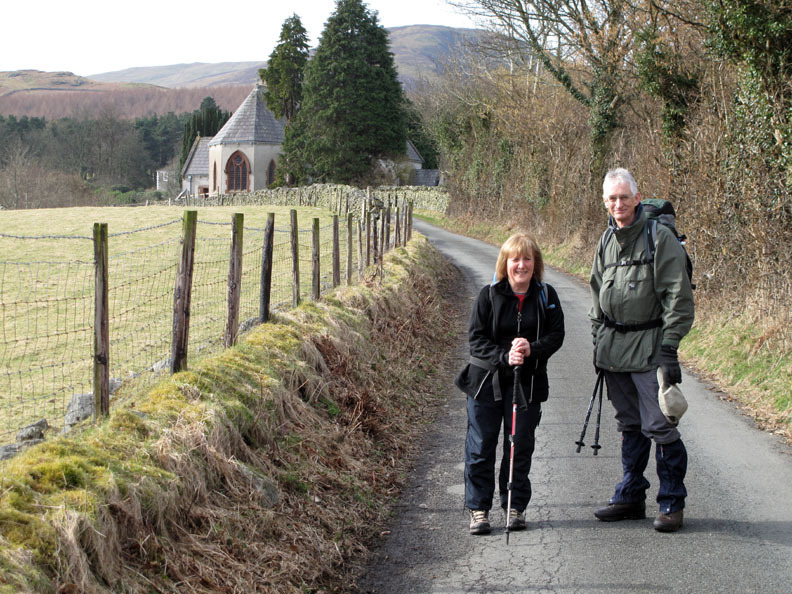 Ann and John as we set off towards Loweswater Church. 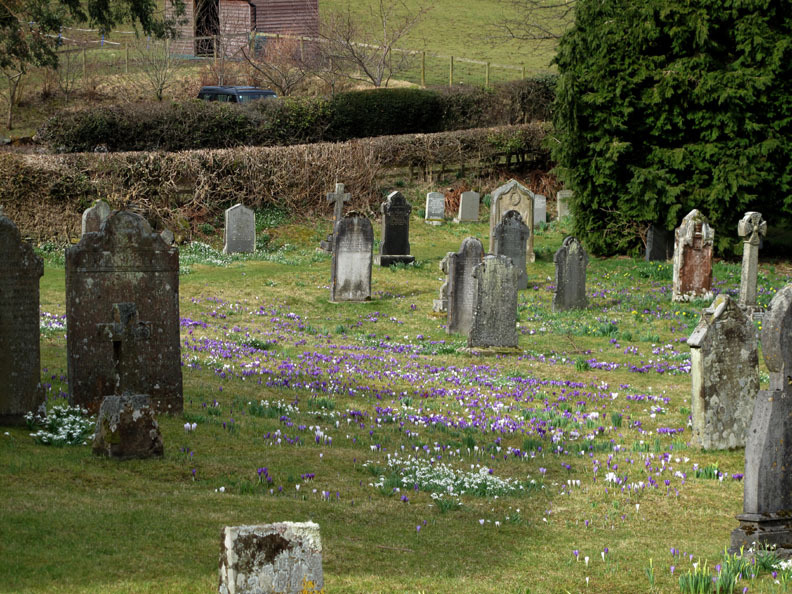 The graveyard is covered in beautiful crocuses and spring flowers. 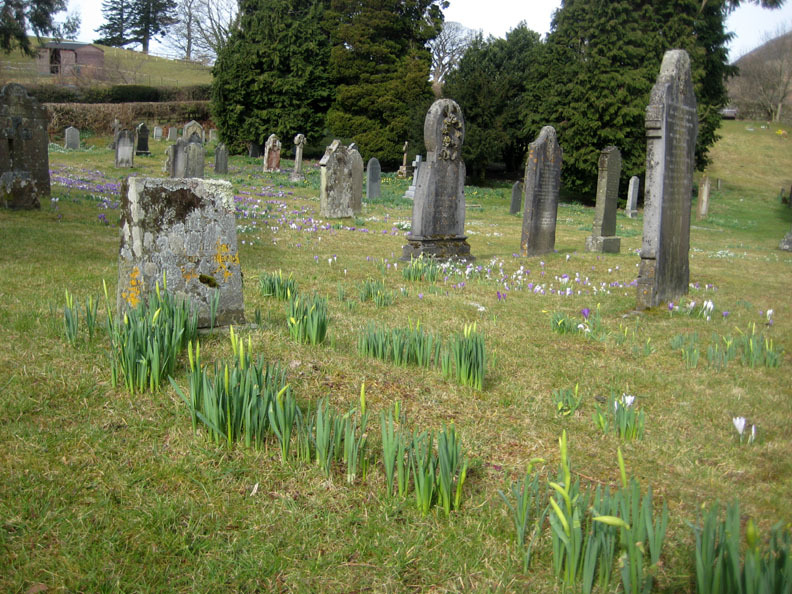 Several graves have a surround of newly sprouting daffodils. 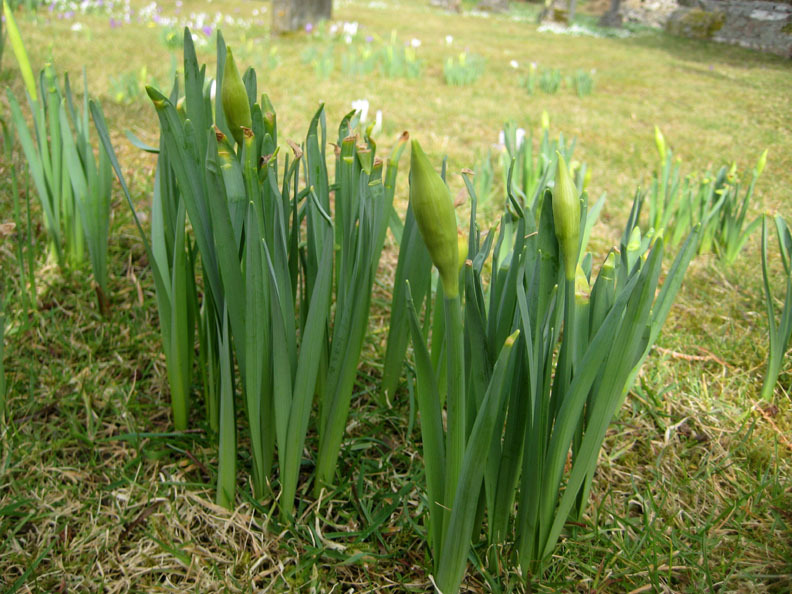 Still too early yet for blooms, we are about three weeks behind compared to the last few years. Getting down low . . .
We thought when Ann laid down for the previous photo that she was thinking of getting measured up for a plot ! 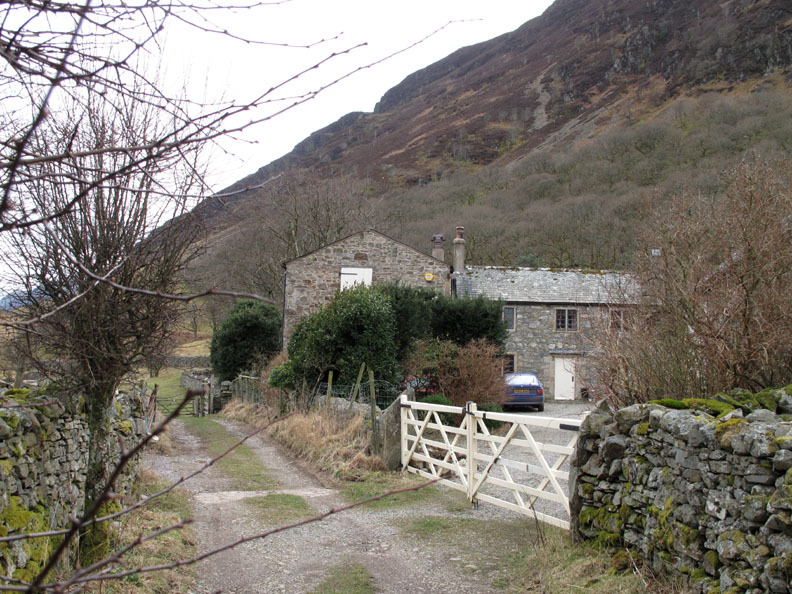 The farm track and bridle way towards Mosedale makes several sharp turns as it progresses. 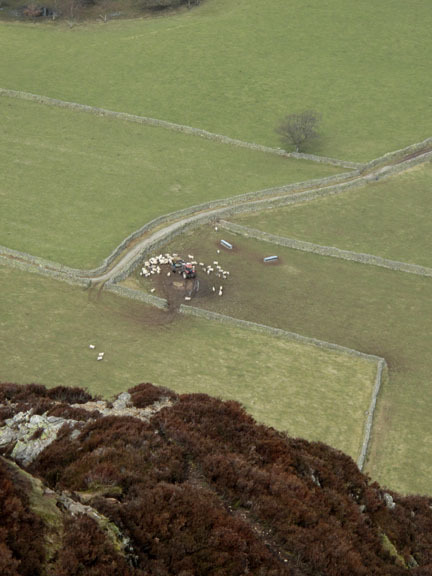 The sheep have knocked stones off the wall again as they jump down where the field fence beyond the wall is broken. Through the gate and we start the climb up through the woods . . .
. . . across the grass and onto the stony fell side. 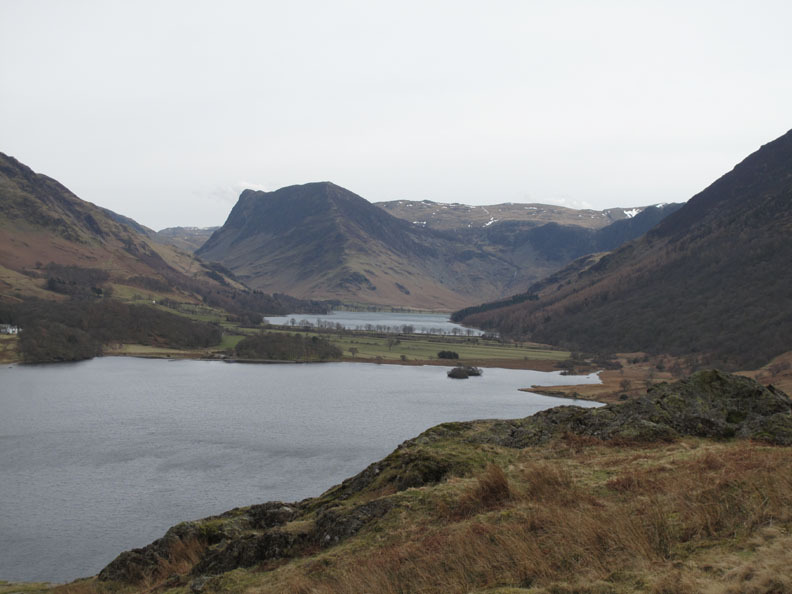 Looking down on the Kirkstile and the valley start of our walk a short while back.
" I can see my car from here " says John . . . it's the grey one between the red car and the red phone box. 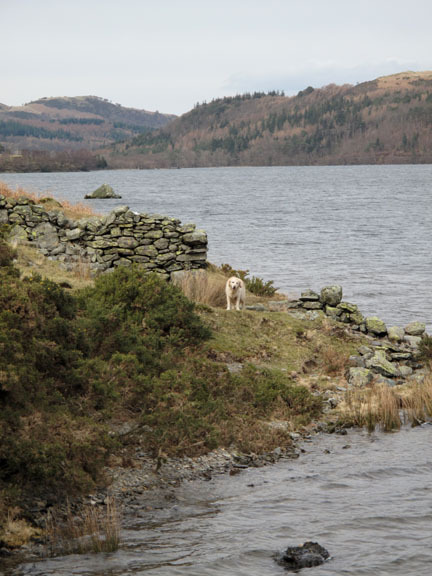 Harry has spotted something down below . . .
. . . Chris has just delivered a bale of hay for his hungry sheep. What's this . 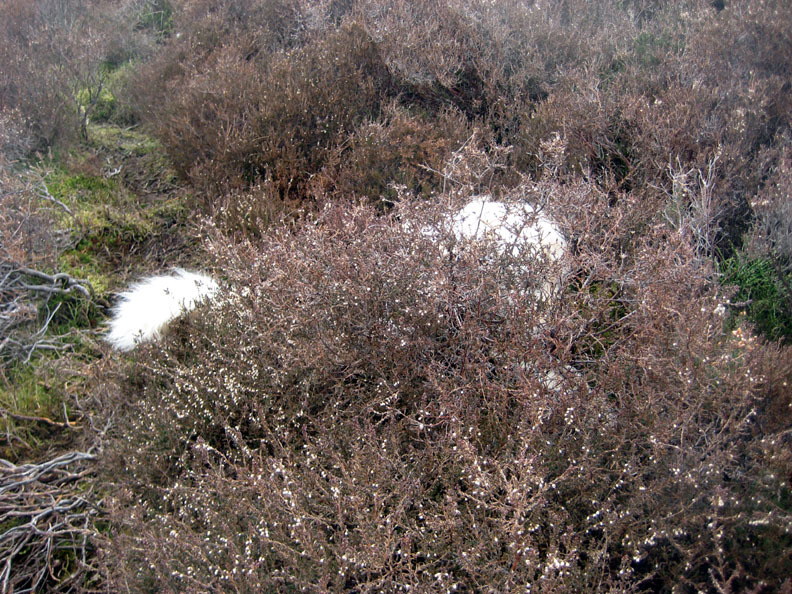 . .
" A Spot the Dog competition " ? 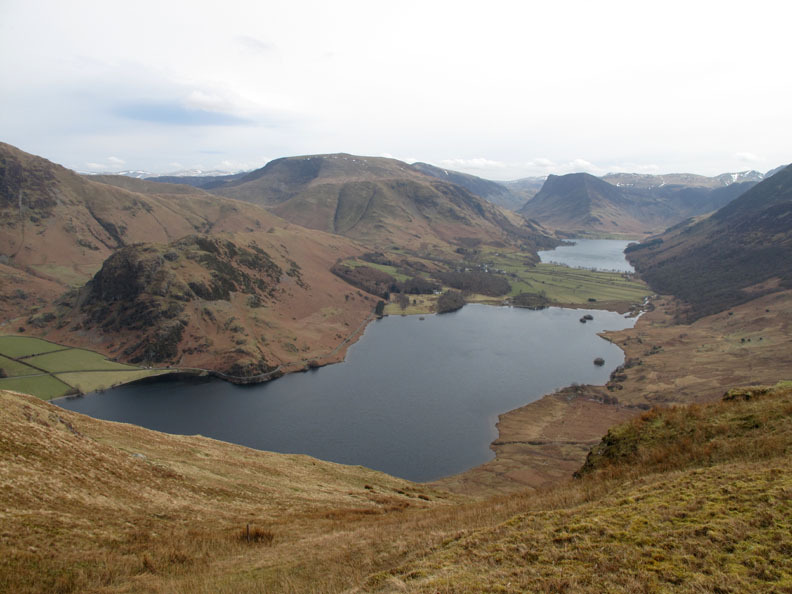 The 'Surprise View' of Buttermere, two thirds of the way up the steep ascent. 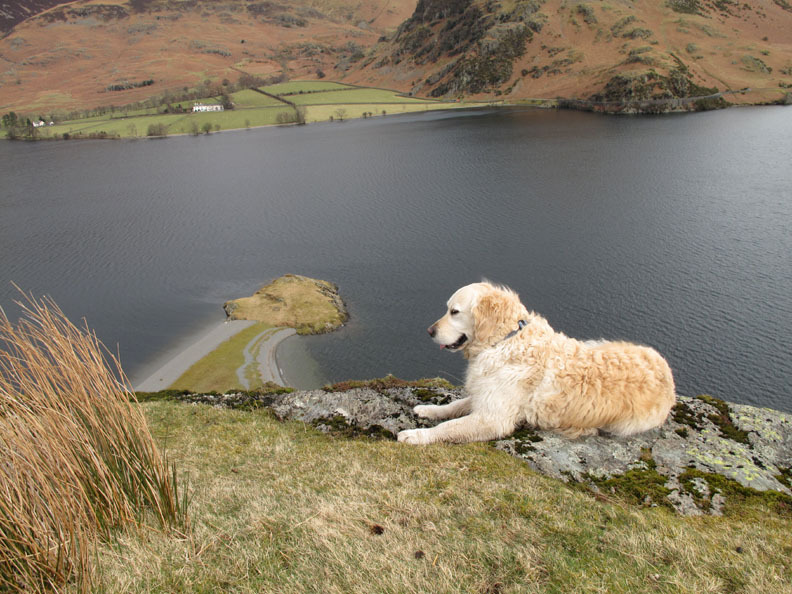 John would go closer but he's not too keen on the steep drop beyond ! 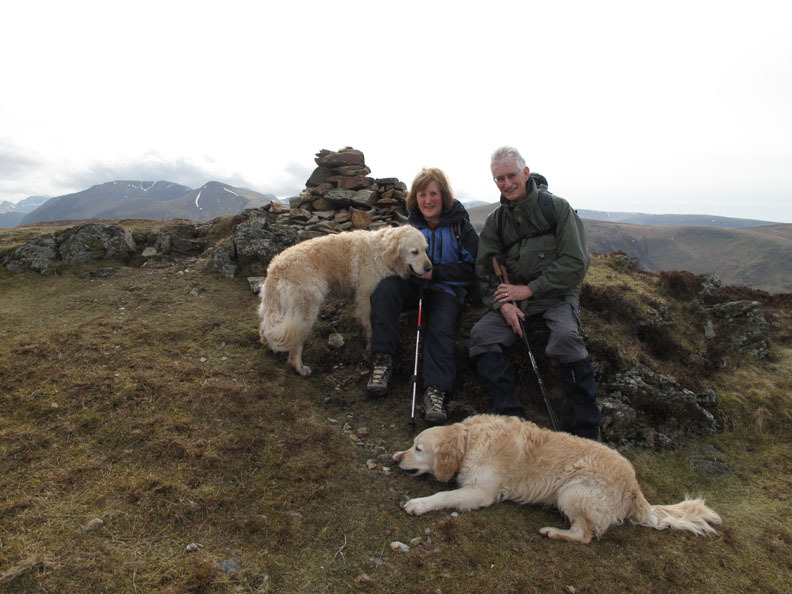 Safely on the summit at the northern end of the fell. of the whale-back shape of Mellbreak. 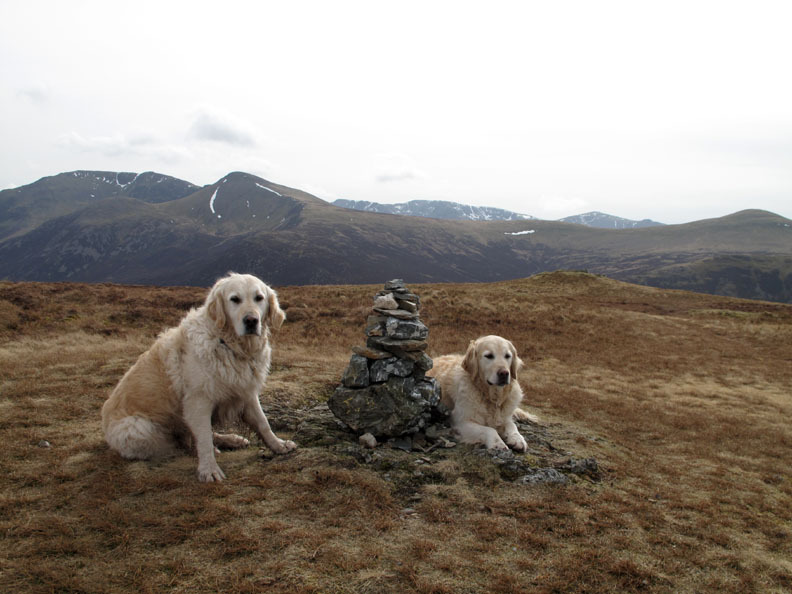 but you can't claim the fell unless you visit the higher top. so a few moments were invested in re-building it. If we had a brush we would have tidied the dogs up for you too ! 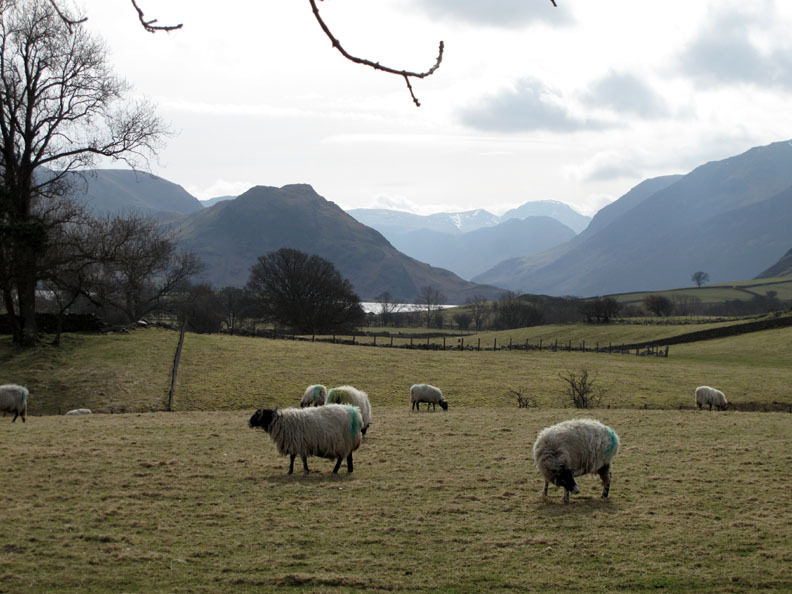 From the southern end, the views down towards Buttermere are superb. 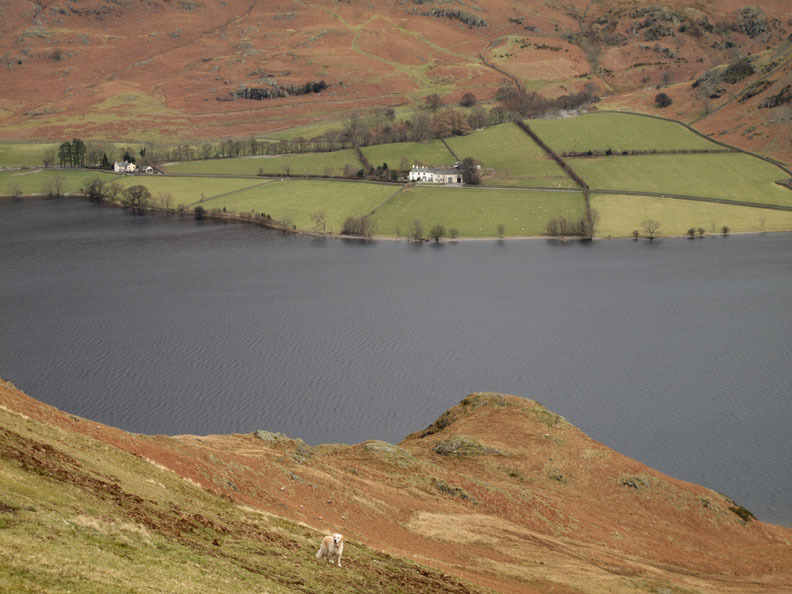 Only the smallest patches of snow still hang on the high fells at the back of the photo. Gaining slight shelter from the southerly breeze we stop for lunch. A few immortal words from a couple passing by . . .
" Don't get to comfortable . . . you know it will be dark before morning " . . . hmm . . . yes. 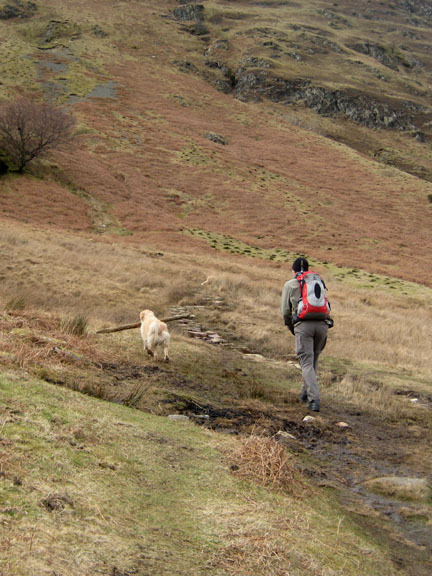 heading down towards High Ling Crag. 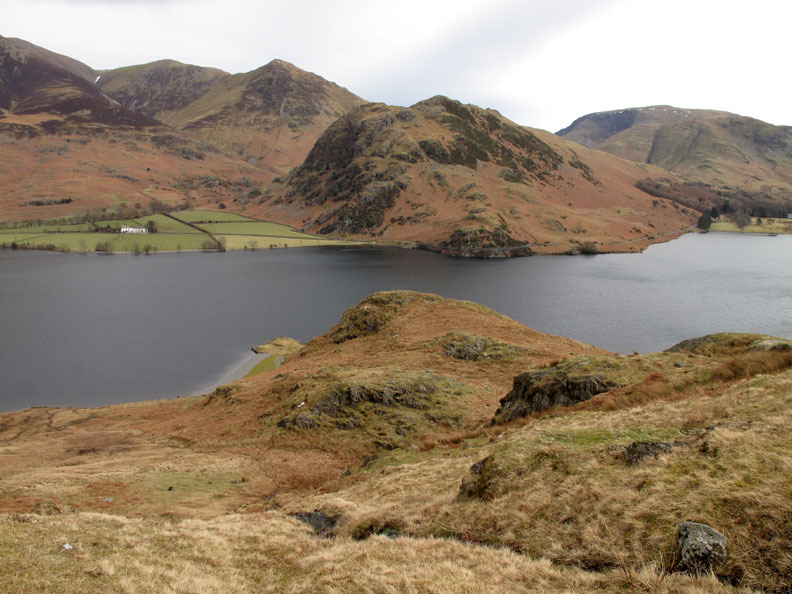 It's interesting how Whiteless Pike, Rannerdale Knotts, Low Ling and High Ling Crags are all in alignment. 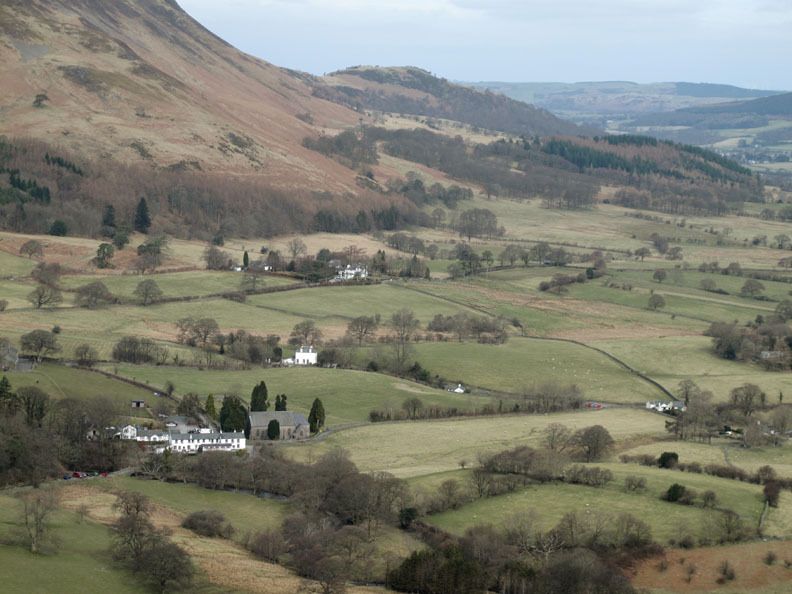 Could it be to do with some long ago volcanic intrusion into the valley ? 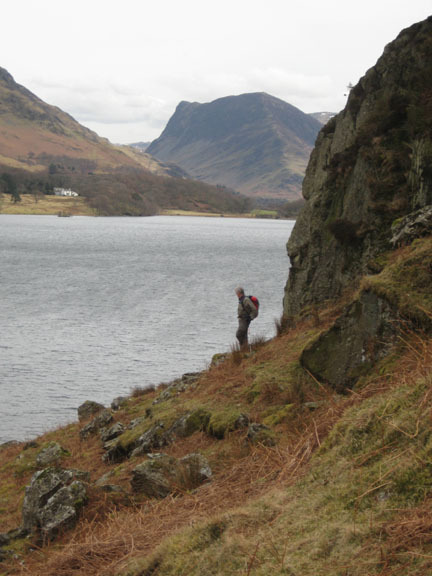 but the sky is getting more overcast and all the colour has been lost from above the High Stile Ridge. 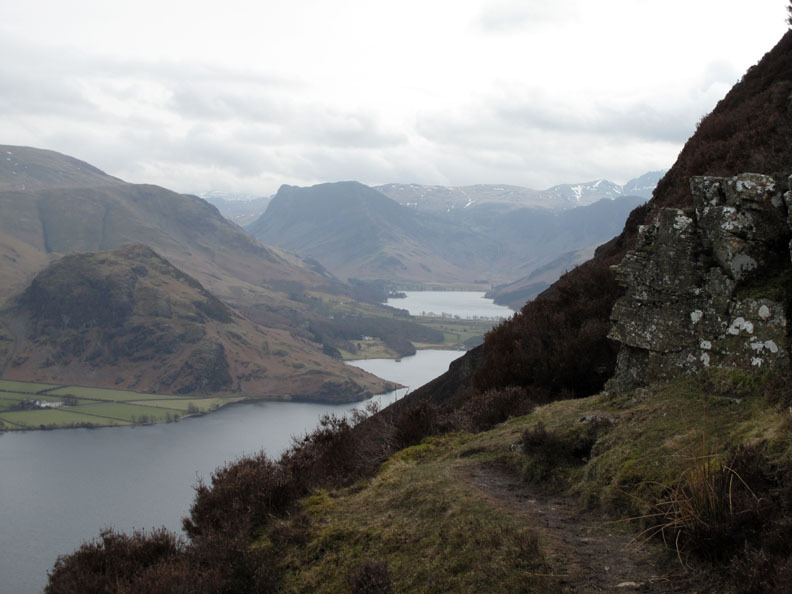 Fleetwith Pike at the head of Buttermere, as seen from the top of High Ling Crag. 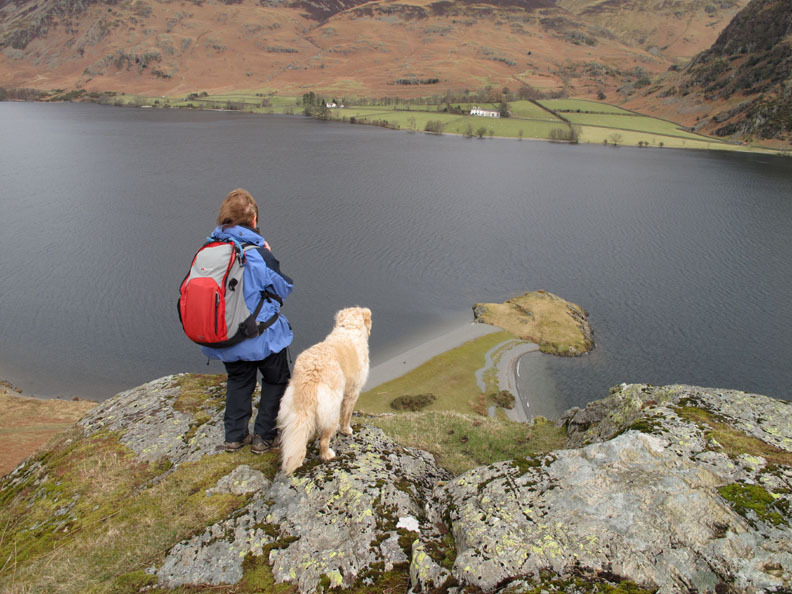 Ann and Harry look down on the water and the isthmus of Low Ling Crag below. 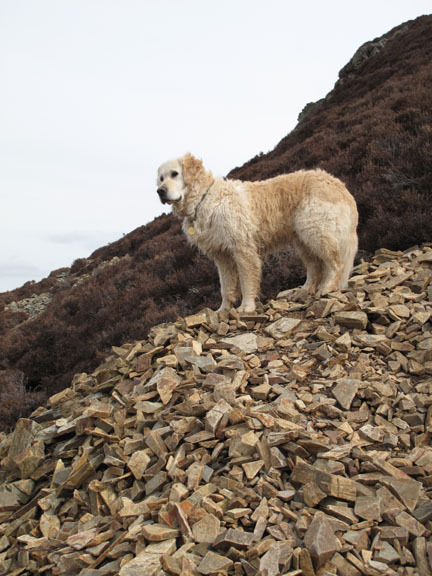 Has it ever struck you how the lower crag looks like a golden retriever's head ? See what we mean . . . it's even got the right ears ! Too steep to descend that way . . .
. . . so we back track slightly before dropping down. 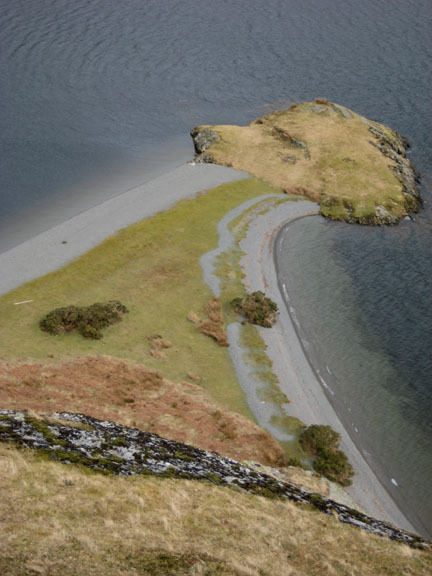 I take a faint path close to the base of the cliff. 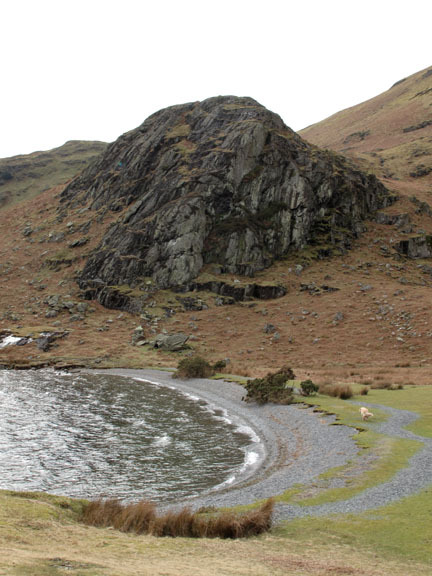 High Ling Crag from below. Time for a swim . . . rather you than me today. Harry finds an old fencepost and pretends it's a stick. 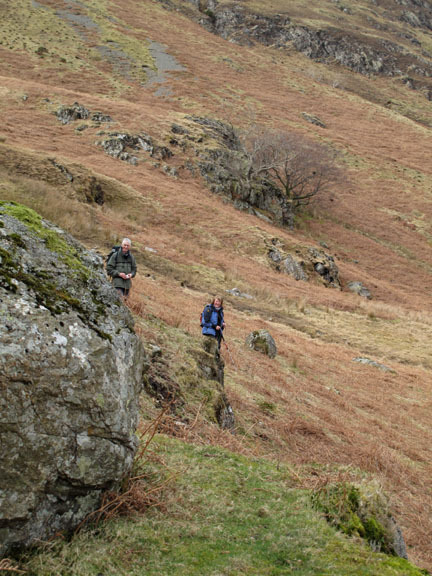 Bethan in the lead again as we near the Iron Stone. 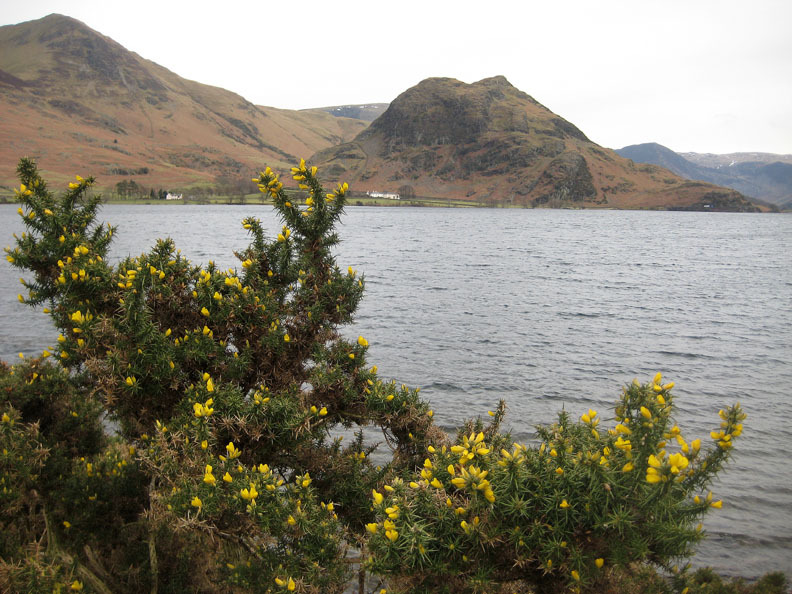 The gorse is just starting to flower, adding a little colour to the lake side. An old round shelter, possibly a shooting position (?) 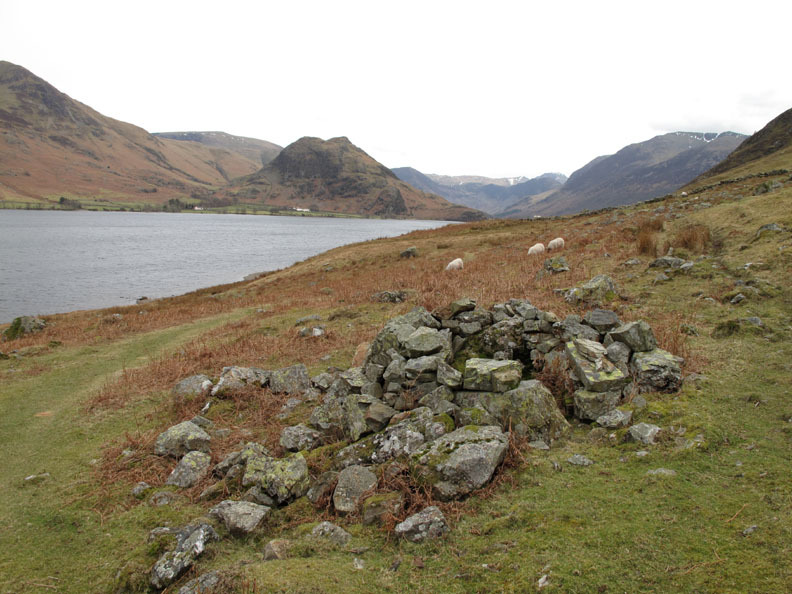 on the fell side well above the lake. 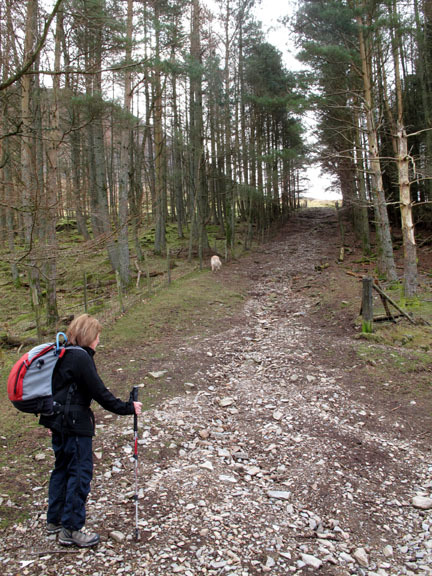 Nearing the end of the walk now . . .
We pass close by High Park House that we had looked down on as we climbed earlier in the day. Back to the sign post . . . so it's only a short walk back to the cottage from here. This site best viewed with . . . Tea and scones . . . this time home-made at the cottage !